Russian independent gas producer Novatek and state-run Rosneft have signed several agreements with companies purchasing liquefied natural gas. The agreements pave the way for these companies to export LNG without Gazprom brokering and opens the way for Novatek and Rosneft to compete for new Asian markets. Novatek has signed a deal selling a 20 per cent stake of its $20 billion Yamal-LNG project in north-west Siberia to China National Petroleum Corporation (CNPC), an acquisition estimated to be closed by 1 October 2013. Novatek also struck a long-term contract for supply of at least three million tons of LNG per annum to China. The deal signals the gradual end of state-controlled Gazprom’s monopoly on exports of natural gas. “We offer to lower restrictions gradually on LNG exports,” President Vladimir Putin said at the International Economic Forum in St Petersburg, adding that demand for the frozen gas in the Asia Pacific region was growing rapidly. Rosneft has also struck contracts on LNG sale and purchase with Japan’s Marubeni Corporation and Sakhalin Oil and Gas Development Co., Ltd. (SODECO). “LNG will be delivered to Marubeni under a new LNG project Rosneft intends to develop in the Russian Far East. The Heads of Agreement outlines key commercial parameters, which will underlie the future long-term LNG supply contract,” Rosneft’s press statement says. Rosneft plans to deliver 1.25 million tons of LNG to Marubeni annually on a long-term basis starting from 2019. “Today at the forum we sealed a number of new documents as part of Rosneft partnerships with international oil and gas majors ExxonMobil, Statoil and Eni… In fact, this is a new stage: we move on to a full-scale cooperation in exploration, production and technology with Rosneft strategic partners,” President Putin told participants in the round table at the Energy Club Summit: Reshaping Global Oil Markets. Gazprom currently holds a monopoly on exports of pipeline gas and LNG. Novatek and Rosneft are lobbying for LNG export rights, with the latter agreeing with ExxonMobil to build an LNG plant in the Russian Far East estimated at $15billion. Earlier this year the head of Rosneft Igor Sechin suggested splitting Gazprom, Russia’s gas monopoly, into two distinct companies – transporting and extracting. 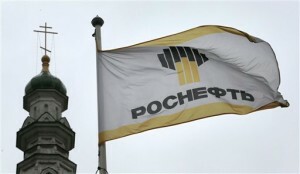 Experts believe this would boost Gazprom’s competitiveness, as it will allow Rosneft to put more pressure on Gazprom.